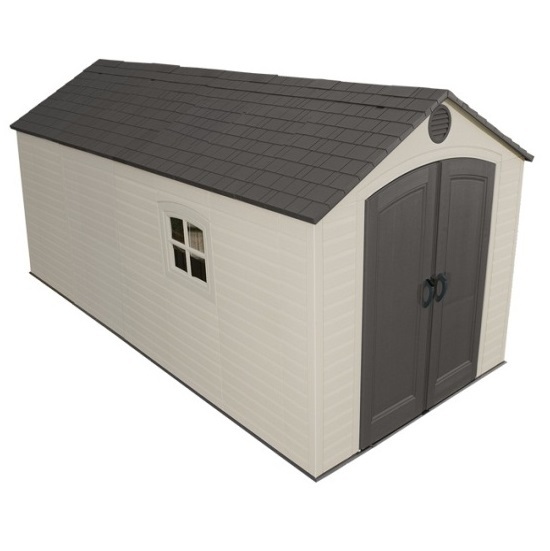 Lifetime Storage Sheds - 60075 Plastic Storage Shed 8 x 15. Lifetime Products continues its polyethylene plastic blow-molding genius with these plastic storage sheds. 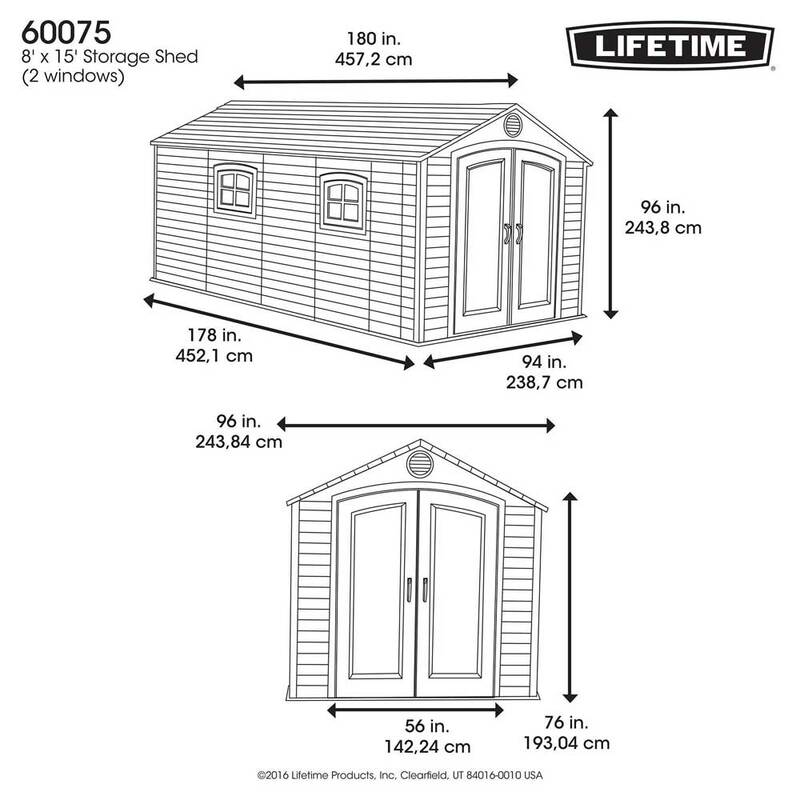 The 60075 features a spacious 8 x 15 ft floor plan. The overall height of these plastic sheds is also about 8 feet. This floor plan is sufficient to store many ride-on-lawn mowers. For instance, the Ariens Zoom XL 42 riding lawn mower has assembled dimensions of 52 inches W x 69 inches D x 42 inches H. The door opening for Lifetime 8-foot wide sheds is 56 inches wide and 76 inches high. 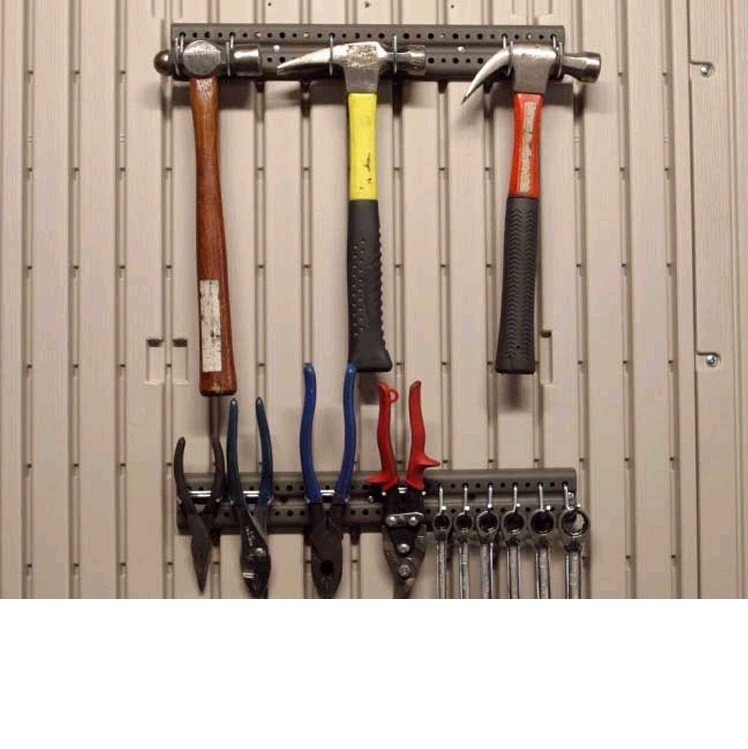 Store your tools with ease using the included peg strips and tool hooks. Storage shelves are no problem with one 90 inch wide shelf, 2 30 inch shelves, and 2 corner shelves. 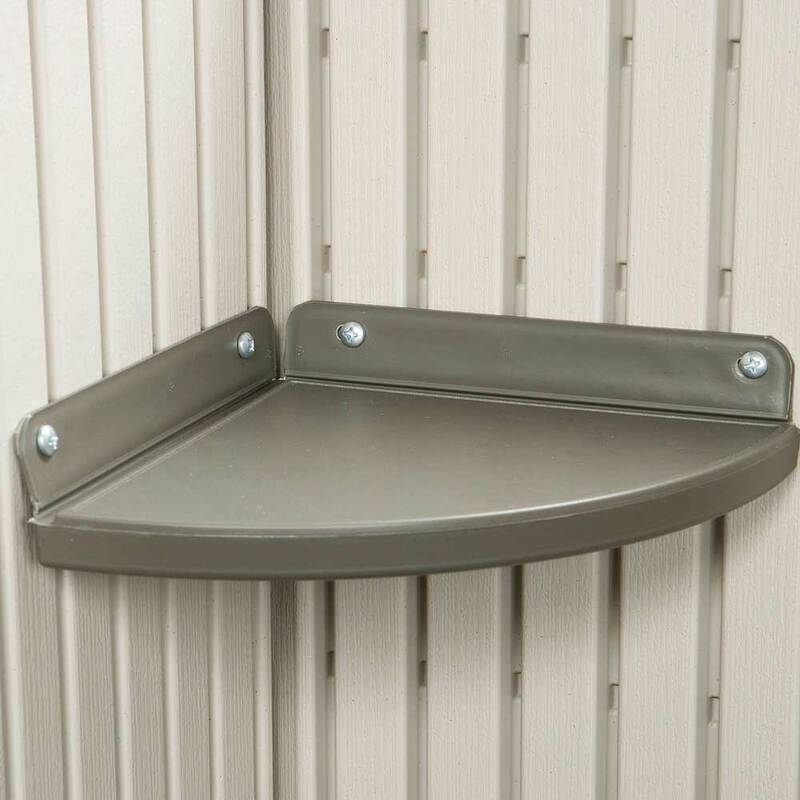 These sheds work great to store your garden equipment, lawn mower, ATV, or swimming pool equipment. Order your Lifetime sheds here. 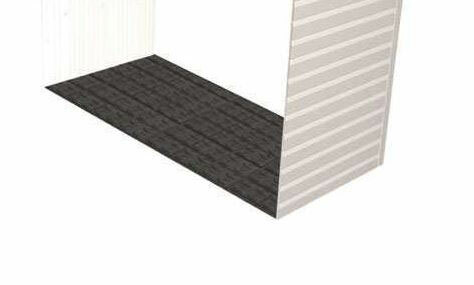 Floor footprint: 94 inches W x 178 inches D.
Floor designed with a slip-resistant impression. The floor is easily cleaned and resists stains from oil and other things. Lifetime shed floors are not weight bearing. A support structure is needed underneath the shed. 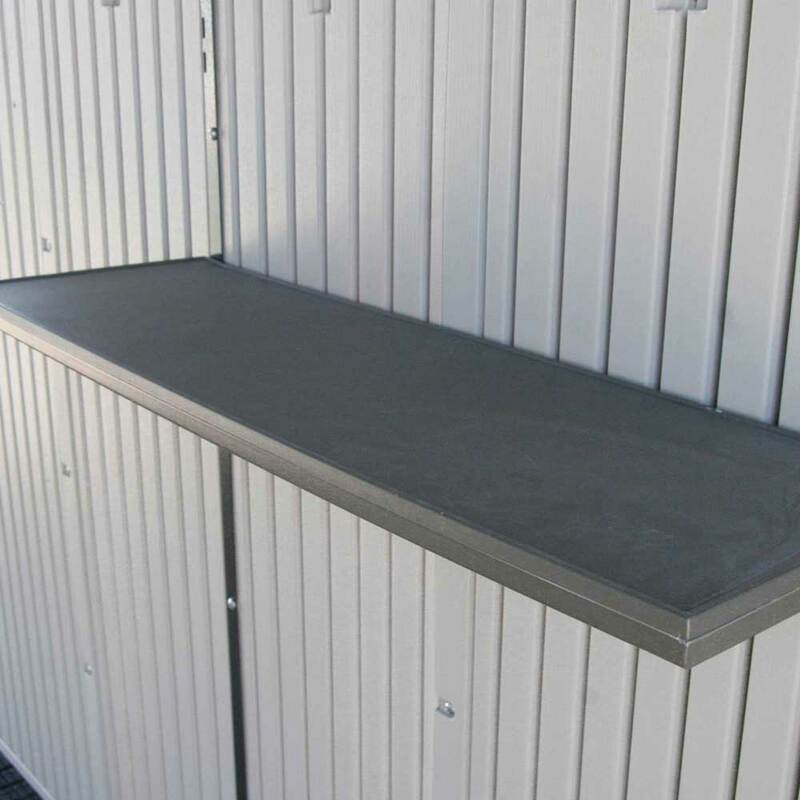 Most support structures for these storage sheds are either a cement slab or a wood framework. 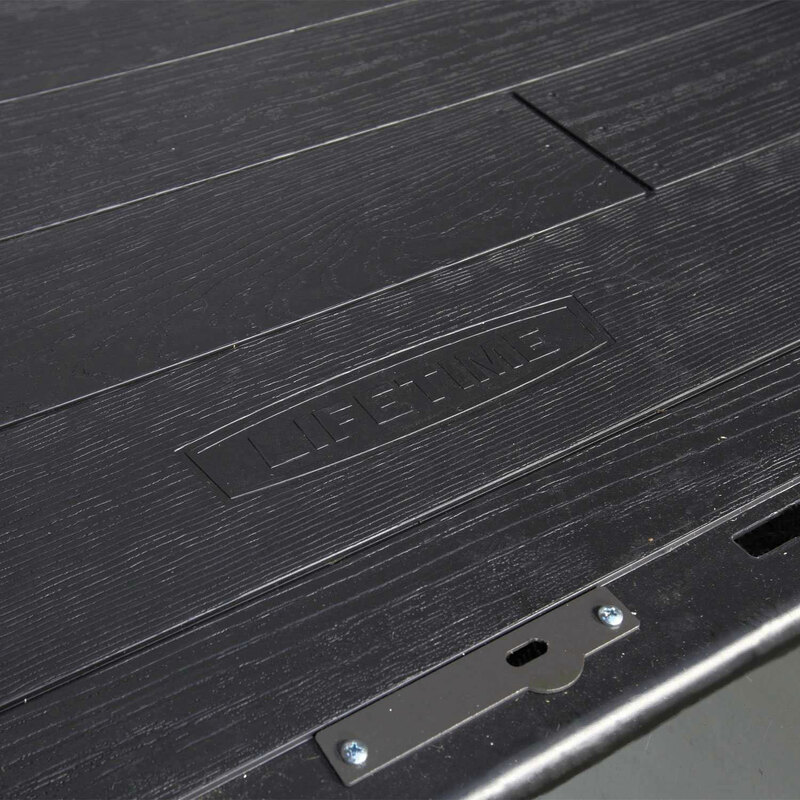 Lifetime shed floors have areas where you can anchor the shed to the ground. Lifetime sheds have double walls. Lifetime shed walls measure about 1 inch thick. 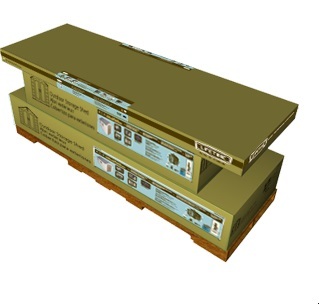 Walls have prefabricated areas to attach additional shelf channels (additional shelves sold separately). Walls are constructed using a paneling system. Every 2.5 ft. is a new wall panel. Wall panels interlock and fasten together. Walls are designed with wood-like impressions giving you the attractive look of wood with the longevity of plastic. Wall color: off white/beige. Some customers have described the color as a light tan. Wind rating for this shed is 65 mph. The roof is made of polyethylene plastic. The roof has a simulated shingle appearance. Roof reinforced with steel trusses. Shed door color: dark brown. This outdoor shed has a single double-door entry. Doors have steel reinforcements for increased rigidity. Doors have internal spring latch mechanism. Interior dead bolts help the doors stay closed tight. 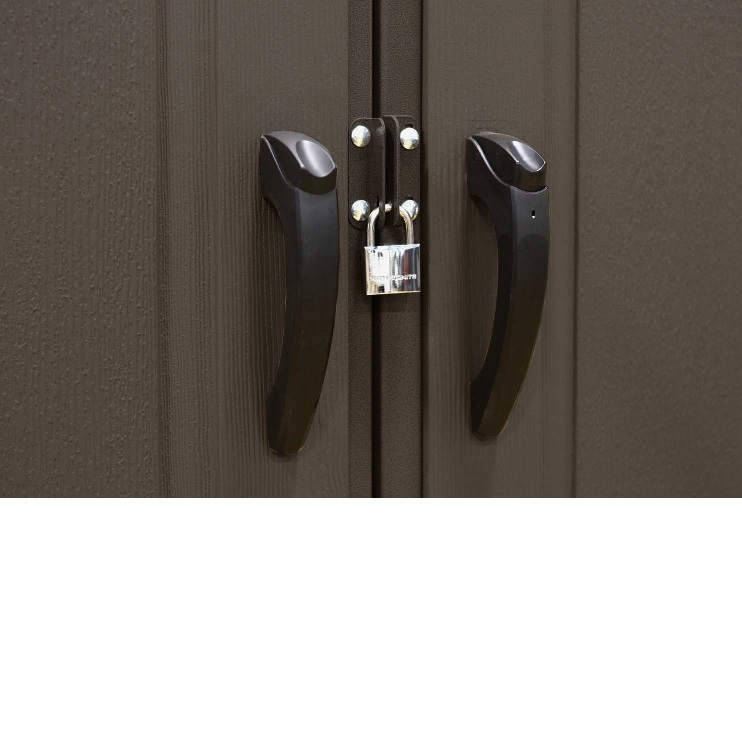 Exterior padlock loop to lock the shed to keep contents safe. 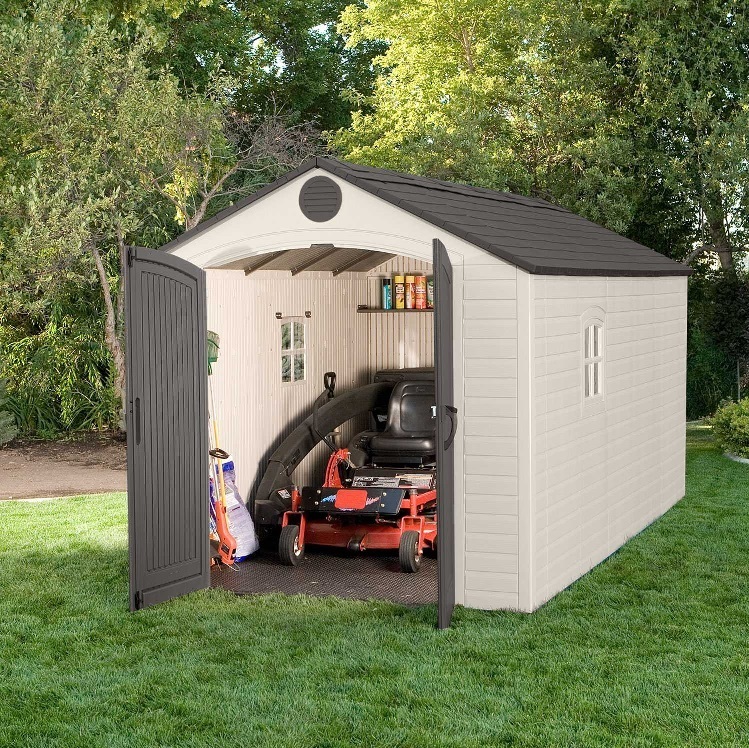 Shed door opening dimensions: 56 inches W x 76 inches H.
Includes 5 Small Skylights across roof ridge. 2 latch a lock windows. Windows slide open for increased ventilation. Window size: 16.5 inches x 16.5 inches. 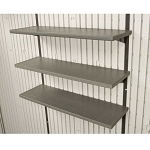 Includes 1 90'' x 9'' shelf, 2 30 inch x 10 shelves, and 2 9.5 inch corner shelves. Also, include 2 16 inch peg strips with tool hooks. 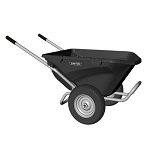 Polyethylene plastic parts are UV-treated, which means the plastic will not fade, crack, or peel in the sunlight. Assembly time with 2 adults working: about 6 hours. Please note this shed is a combination of the 6402 Lifetime Shed and the 6422 Lifetime Shed Extension kit. The extension kit is a 2.5' expansion kit and may have a slightly different floor pattern than the rest of the shed. This shed is delivered via an LTL freight carrier for a curbside delivery. This type of delivery means the customer must be present to sign for the delivery and help the driver unload the product. The customer is responsible to move the product to the desired location and the delivery address. A delivery appointment will be scheduled before the delivery company will bring the package. The total package weight for this shed is about 750 lbs. The shed is shipped in 3 boxes on one pallet. Nominal Dimensions: 15 ft. x 8 ft.
Footprint: 178 inches W x 94 inches D.
Exterior Roof Width: 180 inches. Interior Height: Minimum: 71 inches. Interior Height: Maximum: 95 inches. Square Feet: 108.75 square feet. Cubic Feet: 749.5 cubic feet. What maintenance is required for these sheds? 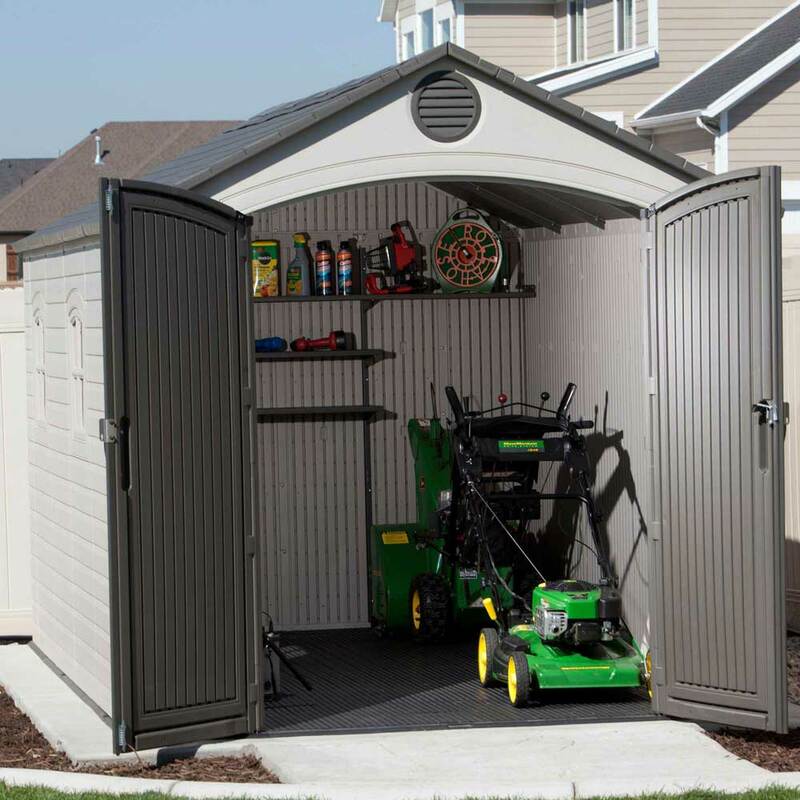 Due to the materials used in the shed construction, little to no maintenance is needed. The plastic parts of the shed will not fade, crack, or peel so you do not need to repaint. The plastic is also stain resistant and is easily cleaned. Can Lifetime sheds be painted a different color? Polyethylene plastic does not take paint well. Customers in the past have painted Lifetime sheds but had to frequently repaint. What building restrictions are there for Lifetime sheds? Building codes and covenants vary by state, by the city, and sometimes even by neighborhood. Consult local authorities to find what restrictions you have in your area. The most frequent concern customers have with their cities is dealing with the square footage of the shed. In these cases, when an exterior structure exceeds a certain square footage, a building permit may be required. How are warranty claims handled? In the event you need warranty help, the warranty is handled through Lifetime Products, the manufacturer. Consult your product manual for contact information. You will need a proof of purchase, i.e. your receipt or similar data. Many times, Lifetime will request pictures of the affected area you are wanting a warranty claim. The assembled shed is very nice. It is sturdy enough and its outside appearance is very attractive. Its composite suggests minimal maintenance and the ease with which you can accessorize is great. Assembly is RIDICULOUS!!! Whoever thought it was expeditious or cost saving to provide instructions with no words and just minuscule blurry pictures, needs to rethink their decision. You better have some mechanical or engineering skill or a close friend with these skills to whom you do not mind being indebted to for the remainder of your life. That being said, assembly not withstanding ... The finished product is Great. - Shed - 5 star, Ease of Assembly - 0 Star. I was a little hesitant when I was shopping for a shed like this especially since I was not able to see one in person. There are no places locally where I am at to see one. But I took a chance and ordered it any ways and since I received it and the free shipping was an excellent selling point to me too. But now that I have put together the shed and have see what it looks like and how easy it assembles I am so happy that I purchased it. It has got to be the nicest shed I have ever purchased. I also love the idea that I can purchase extra extension to make the shed bigger, which I definitely will be getting. The night after I put together the shed it rained really heavy and combined with real heavy blowing wind. I figured this was the perfect test and the next morning I came out and there was not a drop of water at all inside the shed, and the wind had no effect on the shed either. I will never buy another shed from anyone else ever again, the lifetime sheds are the best I ever had and you never have to worry about it rotting out or rusting and you never have to worry about painting either. The only thing I would recommend is if you live in places where you have a lot of bad weather and a lot of snow, I suggest purchasing the heavy weather kit, it makes the shed virtually indestructible from extremely bad weather. One other really positive selling point that I like was if you do need to move the shed for any reason it is easy to take it apart to move it. Which was perfect for me since I am renting and will be moving it in the future when I get my own home. I give Lifetime sheds a 20 on a scale from 1-10. Best price around for the 8x15. Had not purchased anything from Competitive Edge Products before, but felt after reading the reviews and speaking with a live person at the other end of the 800 number, I figured Id give it a shot. I needed a shed to hold tools and other items on some property I recently purchased. I wanted something I did not have to paint and did not want to worry about wood decaying or termites. I was impressed with the sturdiness of the shed. It took a friend and I less than 5 hours to put it together. Instructions were very easy to follow. The walls will be a little flimsy until you get the trusses and roof panels locked in then it is all locked down. Had 30 mph winds and several inches of rain here in Houston today and the shed is leak free. after ordering the shed I received a phone call with the delivery information. I received another call from the delivery driver when the shed was a couple hours out. No problems with the shed or the company. Well worth it all around. Great product !!!! Terrible Instruction manual !!! Absolutely, Positively recommend this shed, great quality, awesome fast shipping. Instructions and parts labeling on the other hand 'WORST' I have ever seen. This should not deter you from purchasing this shed but be prepared to very confused !! We installed this with three family members. Ordered from Competitive Edge and received it in a just a few days. Delivery was flawless. Freight company was very kind and probably would have even put it in the backyard if we had a way for their truck or pallet jack to allow them to do that. The yard was fenced in though so there is no option to do that. The boxes are very heavy (too heavy for us to lift) so we brought the pieces to the backyard by carrying them and opening the boxes one at a time. We ordered extensions for ours so we were worried we might be more confused with the instructions, but it was actually quite intuitive. We didn't even have to use the instructions for the extensions, because once you put one for piece down you know how they all go. And once you put one wall section down you know how they all go in. 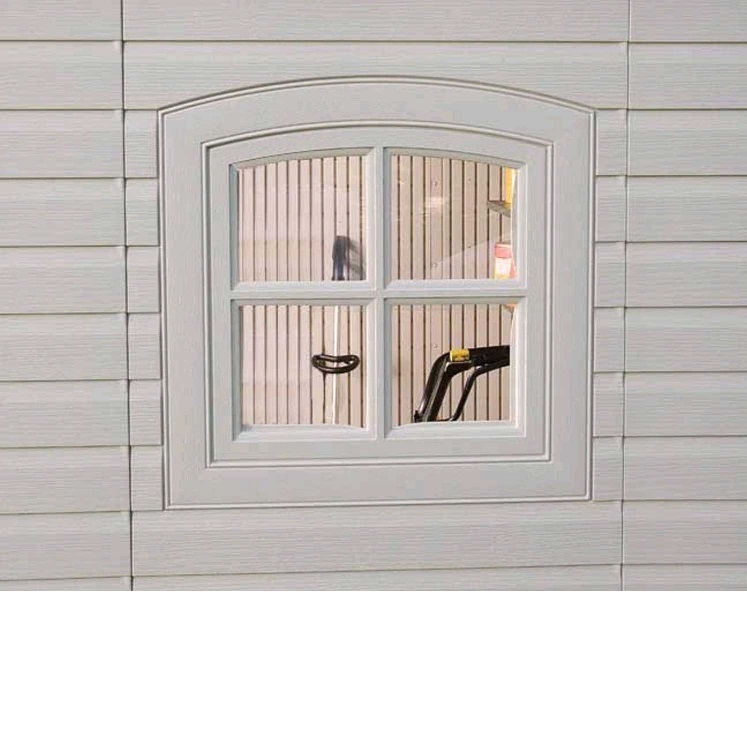 The window is in its own panel as well so we don't have to put that in the same place it shows in the picture. The hardware was all included and we only run into one problem-we assembled in the afternoon and ran out of daylight. Make sure that you give yourself plenty of time. With three people it took us about six hours total. If you do need to assembly yourself you just need someone to hold those roof trusses in place for you. We didn't put ours on a concrete foundation or anything like that. We did the wooden platform that the instruction manual shows you how to do. It was nice, because it told us how many two by fours we needed and how much plywood so we didn't have to measure and reason where we would likely have erred. We put it on a wooden platform, because the neighborhood Association did not allow "permanent" structures and this one could be completely disassembled just as easy as it was put together. There were no nails and we didn't even have to use power tools if we didn't want to. We did use cordless drills and I definitely recommend that, but don't put the setting on it too tight where you strip any of the hardware. When all was said and done it is a beautiful looking shed, well-built, simple to put together. I'm not sure what other customers ran into with instructions, but I would imagine if you start in the order it recommends you can avoid running into other issues. Meaning, if we would've started with the wall pieces we would have had to start over since the core goes down first. It was everything that was advertised. Simple assembly. I bought this online after seeing one at a retail store. It was easy to install with very clear directions to follow. It seems very sturdy and is working well for me. After researching many various types of sheds, everything from pre-built wood panels that you assemble to drop shipped assembled sheds I settled on this. I have to say at first I was not excited about a composite/plastic shed, well because, its plastic. After comparing prices it was a no brain-er. You will not find a shed of this size for this price, you will not. I am happy that Lifetime sells sheds of this size because you really want something with a lot of space. Competitive Edge did a great job with keeping me informed of the shipping status. It came freight on a pallet and they dropped it in my driveway. Everything was wrapped and protected. From there I opened the boxes and moved the pieces to their location. The most important thing about this shed is to build it on a solid level surface. That took me the most time. I put it on a thick plywood base, basically a deck platform. Then I started assembling the floor. A few of the floor pieces didn't fit exactly like I wish they would but it wasn't a big deal, not worth getting replacements. Next was the wall panels which you certainly need TWO people. Then the headers, doors, rafters and roof panels. Everything lined up very well and I would associate that to having a LEVEL foundation to build on. The doors take some time to get leveled out but the instructions do a great job showing you how. Overall I am very happy with my purchase. It is a very nice shed and the shelves are a very nice touch to the inside. If you are on the fence about owning a plastic shed, trust me they are not what you think. Install went super easy and fast. These are way easier than arrow sheds, fast delivery is awesome. Q: Can I add a 2.5 extension to the 8 x 15 Lifetime shed to make it 8 x 17.5? Q: I am trying to download the assembly instructions on the 8 x 15 shed. Please email me the assembly instructions. I purchased the storage shed in June 2017. Thank you. Aaron. 971-409-8135. Here is the required symbol of? Q: what size pieces? And what is the weight of that piece? A: The walls are 76” high on the sides, and the doors are 56” wide by about 76” tall. 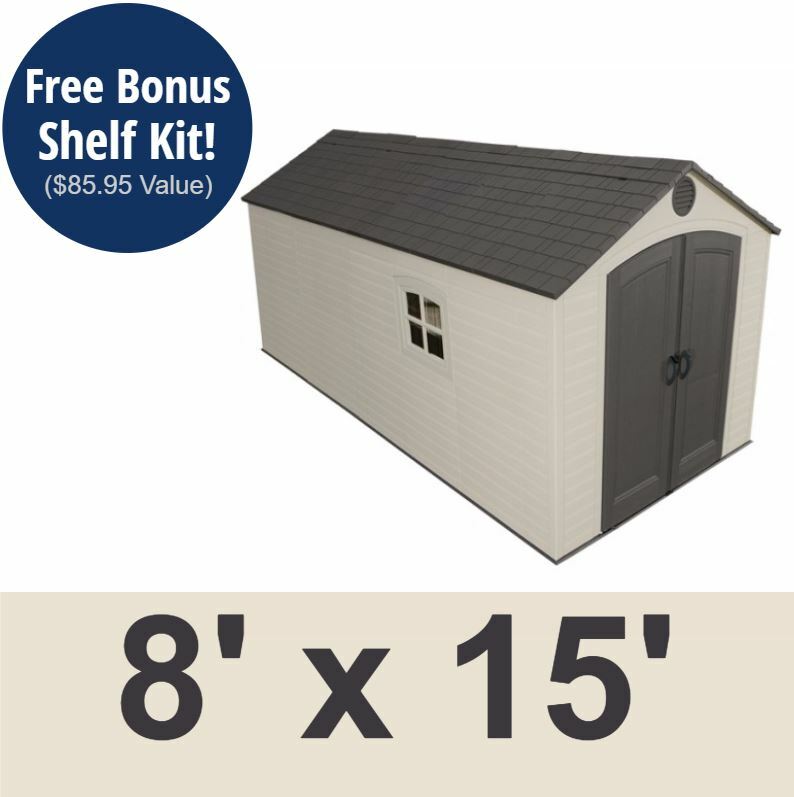 Q: CAN THE 8' X 15' SHED BE PUT TOGETHER INITIALLY AS A 8' X 12.5' SHED AND THEN THE EXTRA 2.5' BE ADDED LATER? A: Yes, the shed is made up of 2.5’ segments, you will just need to take out 1 floor panel, 2 wall panels, 2 roof panels, and a supporting roof truss. Please keep in mind that this may make the shed look lopsided with the window, as the window will then be closer to one side then the other. Q: We normally keep things in our outbuilding that could freeze. Can you use a small heater in these buildings in the winter? 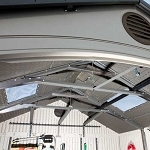 A: The manufacturer does not recommend putting any electrical wiring in the shed. To do so would be at your own risk and would void the warranty. Q: Can I anchor this building to the floor(concrete)? A: Yes, you are welcome to anchor the shed, though you will need to find anchors separately as we do not sell anchor kits for the Lifetime sheds. Q: Can we order this in gray and also can we set our own shipping date to July? A: The color shown is the only color available. The manufacturer does not recommend painting the shed; though you can talk to your local paint supplier for recommendations on painting this type of plastic. If you need the order to be pushed out, then please call us at 86-308-5484x17 to place your order. We can then select a shipping date and hold the order until then to ensure that you will receive your product when you want it. Q: WHAT COLOR IS THE SHED? 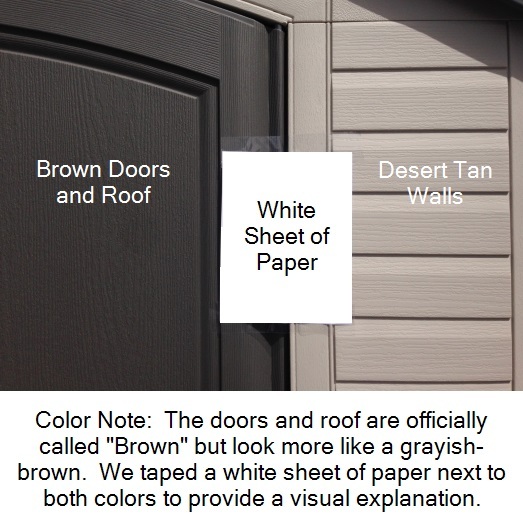 A: This shed is described as desert tan walls with brown doors and roof. I have also added a color comparison image to the images of this shed, just scroll to the last image and you will see the color comparison. 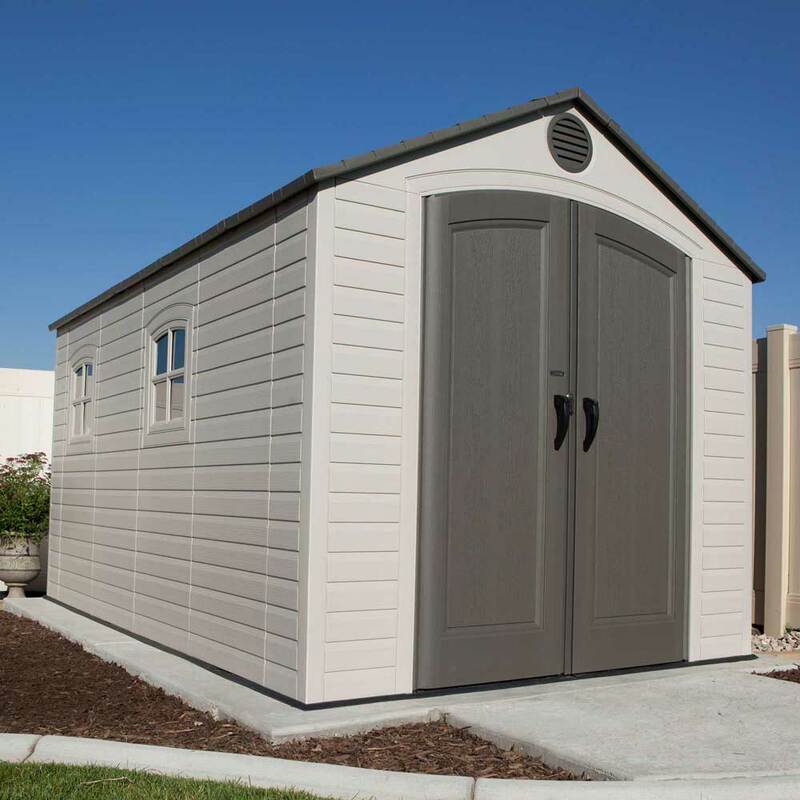 Q: Do you have the gray and white option in this shed or is it tan and brown? A: This is the only color that these sheds come in currently. Q: Yesterday I put this shed in my basket the price was $100.00 different then it is now. Is this right? A: Please contact our customer service department at 866-308-5484 and they will be able to assist you with this. A: Unfortunately, we do not ship these internationally. I'm sorry for the bad news. Q: My debit card will only let me pay $500. 00 a day. Could I call up & make 3 payments 1 each day for three days to pay it off? A: Unfortunately, that would not work. However, you can always contact your bank and have them raise your limit for a one-time transaction of a specified amount and then simply have them change it back. You can also mail in a check. Feel free to contact us with any other questions. Q: How long is this on sale? A: The sale should be going through the rest of the month (May 2016). Q: What are the dimensions if I make a wooden base? A: Length would be 178" and Width 93.5" are the dimensions to build the wooden base. A: Upon delivery can you provide someone to assemble the shed? ?please advise. Q: The door latch assembly hits when I try to close the doors. I have reread the instructions several times and can't find where I assembled anything wrong. I have to have both doors open and shut them together to get past the bumper plate on the left hand door as the nuts that hold the inside latch assembly hit the bumper plate when the left had door is closed. Any suggestions as to what I need to do to fix this problem? A: I've never heard of that problem, but let me refer you to the 800 number on the owner's manual where the experts will help you get this resolved. 800-225-3865. We would also love to know what the result was or what the problem was if you are interested in replying back to this answer that would be great. 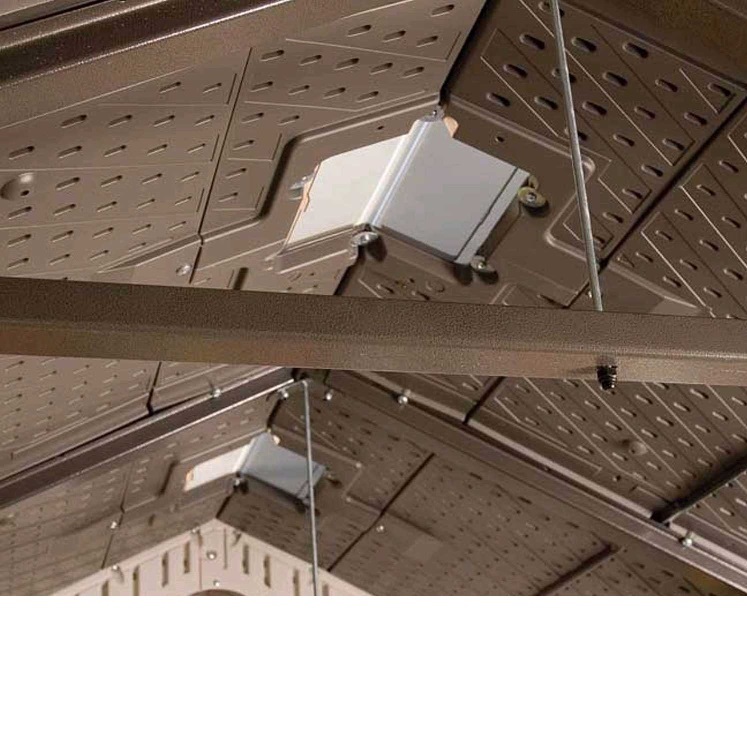 Q: I see their is a version with skylights -- do you sell it? A: This does come with skylights. It includes 5 small skylights to go across the ridge. Floor designed with slip-resistant impression. Floor is easily cleaned and resists stains from oil and other things. 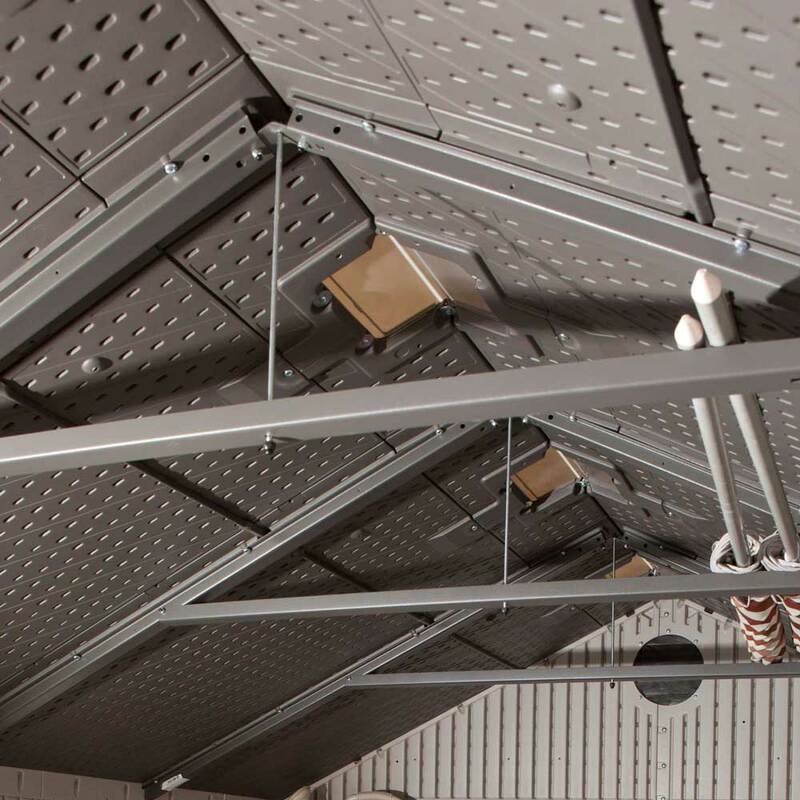 Steel reinforcements in walls help increase the rigidity and strength of the shed. 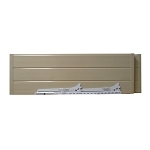 Walls have pre-fabricated areas to attach additional shelf channels (additional shelves sold separately). Wall color: off white / beige. Some customers have described the color as a light tan. 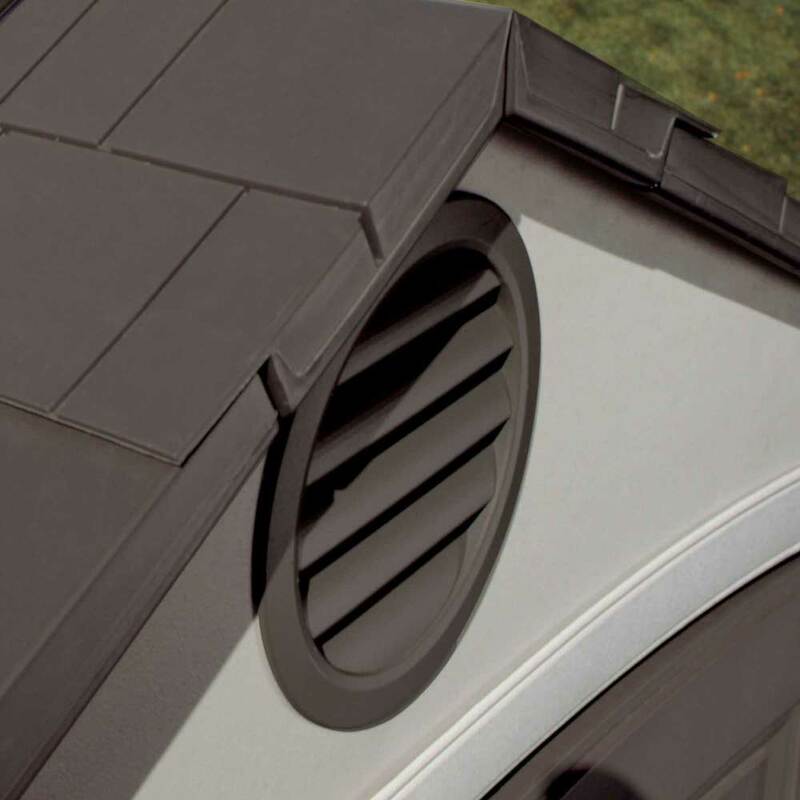 Roof is made of polyethylene plastic. Roof has a simulated shingle appearance. Interior deadbolts help the doors stay closed tight. Exterior padlock loop to lock the shed to keep contents save. Includes 1 90 inch x 9 inch shelf, 2 30 inch x 10 shelves, and 2 9.5-inch corner shelves. Also include 2 16-inch peg strips with tool hooks. 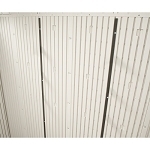 Shipping: Orders for the 60075 Lifetime 8x15 Storage Shed generally leave the warehouse the next business day. Dimensions: 96" x 37" x 36"